As Seoul implements its New Southern Policy across Asia, it is crucial to grasp the region’s diverse local situations and tap into opportunities in emerging cities, according to Indonesian Ambassador Umar Hadi. Speaking in an interview at the Indonesian Embassy in Seoul last week, the envoy advised South Korean companies, particularly automakers and manufacturers in related industries, to do more in-depth analysis of metropolitan and second-tier cities outside of Jakarta, as they will increasingly fuel Indonesia’s future economic development. “It’s not just Jakarta as the only economically important city. New centers of growth are popping up like mushrooms throughout Indonesia, like Makassar, Surabaya, Medan, Bogor and others,” he added. Mentioning Indonesia’s vastness -- the country comprises some 17,000 islands across three time zones -- the envoy said automakers and other companies need to plan their business across Indonesia’s wider territory, where the demand for cars is rapidly growing among the rising middle class. He also said partnerships with local companies in services and finance were important. Hyundai Motor, Korea’s largest and the world’s No. 5 automaker, announced plans in late December to begin producing electric vehicles in Indonesia as part of an $880 million investment in the country. In an effort to diversify its markets worldwide and reduce reliance on the Chinese market, Hyundai and its sister company Kia Motors will build a factory in West Java’s Bekasi, Karawang and Purwakarta integrated economic and industry zone -- its first car-manufacturing plant in Southeast Asia -- with an annual capacity of 250,000 units, including electric cars. The company plans to export over 50 percent of the vehicles manufactured in Indonesia to Southeast Asian and Australian markets and sell the remainder in the country, which is heavily dominated by Japanese automakers. 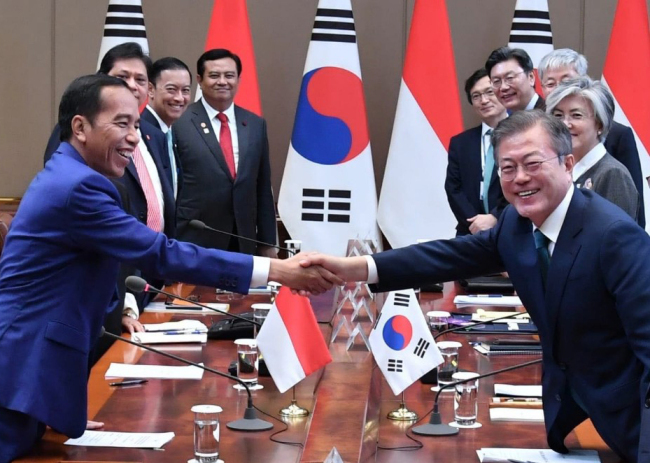 Citing Financial Times data, the embassy said Korea was one of Indonesia’s strategic partners for investment, with Korea plowing $11.3 billion into Indonesia from 2013 through the third quarter of 2018. During the same period, Indonesia became Korea’s second-largest investment destination among the Association of Southeast Asian Nations economies, after Vietnam with $39.3 billion of investment, and the third-largest worldwide. The top Korean conglomerates that have invested in Indonesia are Lotte, Posco, Hankook Tire, GS Engineering & Construction, Korea Electric Power, DW Development, Hanhwa and CJ Group. The two economies registered a $20 billion trade turnover last year, an 11.4 percent on-year increase. Hadi’s priorities are ensuring sustainability in bilateral cooperation across all areas, so that every partnership remains long-term and mutually beneficial, he said. Last year, the Indonesian and Korean governments started a cooperation scheme to reform their regulations to facilitate two-way trade and investment. A wide range of knowledge- and experience-sharing projects are underway alongside joint research endeavors involving industrial regulation, internet of things technology, cryptocurrency, information communications technology and others. Pointing to the 30th anniversary of the establishment of ASEAN-Korea dialogue relations this year and to the upcoming 2019 ASEAN-ROK Commemorative Summit in Korea, Hadi said Indonesia has historically supported the regional bloc for shared peace, security and prosperity, especially by playing an instrumental role in setting up the ASEAN Charter and institutionally strengthening ASEAN.